Park at White Bridge in Upper Coquetdale (NT859114). Follow the private road which runs alongside the Rowhope Burn past the buildings of Rowhope and Trows. On the other side of the shallow ford, take the track to your left, through the five bar gate, and head uphill between the Trows and Wardlaw Burns. As Scotchman`s Ford approaches, be sure to follow the track which bends uphill to your left. Further up, ignore the track which splits away to your left (Split the Deil) making sure to follow the right fork. 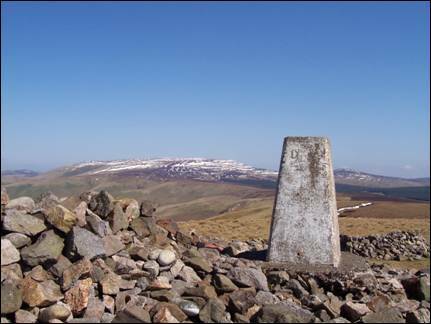 Soon the gate through the border fence is reached and beyond Russell`s Cairn and the summit.